You can read Bill Dedman’s articles for NBC News about the settlement of the Clark estate legal case at http://nbcnews.com/clark/. That site also has an archive of all the NBC stories about Huguette Clark and her empty mansions. See our video page for appearances on "The Daily Show with Jon Stewart," "The Today Show," TV Santa Barbara, The Wall Street Journal, C-SPAN (twice), and CBS 2 New York. 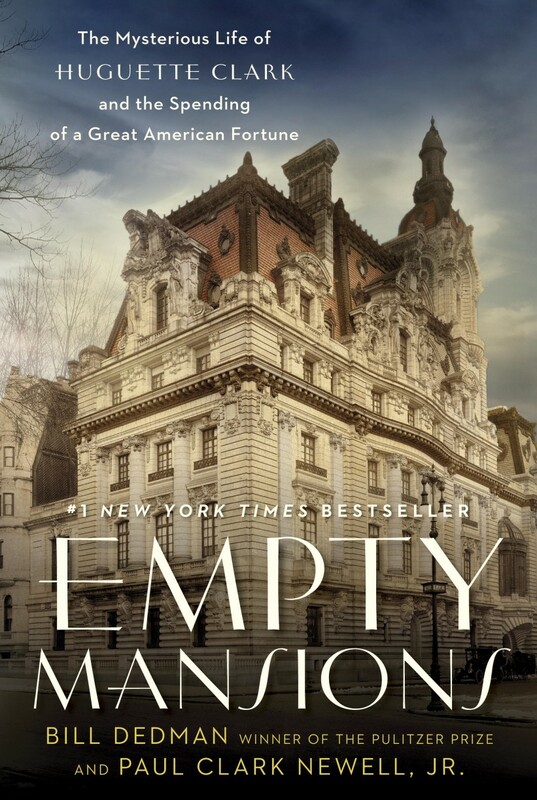 Empty Mansions has been published in the U.K. by Atlantic Books. Look for excerpts and reviews in the English and Irish newspapers. See details here. The book is also out in Australia and New Zealand. The next countries for publication will be Italy, Brazil, and China. NPR's Margot Adler interviewed Bill Dedman for a report on Huguette Clark, not long before Ms. Adler died in the summer of 2014. Listen here. Read Bill Dedman’s interview with Authorlink. Paul Newell and Bill Dedman were interviewed by Erik Pappa for Clark County television during their stop in Las Vegas for events at the Nevada State Museum. Watch the video here. Reuters interviewed Bill Dedman and published a Q&A. Fashion Doll Quarterly has a feature on Huguette Clark and her doll collection in the spring 2014 issue. A page describing how the authors used Ancestry.com for research. A Clark family tree at Ancestry.com, supplementing the family tree found in the book. Bill Dedman was interviewed on WUTC (88.1 FM) by Michael Edward Miller on the “Around and About Chattanooga” show, March 7, 2014, in Chattanooga, Tenn. The full interview is on the WUTC website. Interview, Radio New Zealand, “Afternoons with Jim Mora,” Sept. 30, 2013. Listen to the audio. Interview, with Leonard Lopate on WNYC in New York, Sept. 23, 2013. Listen here. Interview, "America Weekend" with host Paul Harris on Sept. 21, 2013. Listen here. Interview, Bloomberg Radio “Taking Stock” with Pimm Fox and Carol Massar on Sept. 20, 2013. Listen here. Interview, “To The Point” with host Warren Olney for KCRW and PRI, Sept. 18, 2013. Listen here. Interview, KNPR’s “State of Nevada,” Sept. 17, 2013. Listen here. Maclean’s, the Canadian weekly newsmagazine, featured Empty Mansions in its Sept. 15, 2013, issue. DuJour magazine featured Empty Mansions in its September 2013 issue. Curbed, the real estate website, wrote about Huguette Clark’s dolls and dollhouses and Japanese model buildings. Interview on POTUS, Sirius XM channel 124, with Michael Smerconish Sept. 12, 2013. Hear the audio. Interview with John Rabe for “Off Ramp” on Southern California Public Radio on Sept. 12, 2013. Listen here. Here’s an excerpt from the Empty Mansions audio book, as read by actress Kimberly Farr. This is six minutes from Chapter 1, describing Huguette’s arrival in America and the Clark Mansion on Fifth Avenue. Click on the control below to play the audio. And click here to buy the audio book, which can be downloaded to a computer.